All large asteroids have been bombarded over the ages, and as a result smaller chunks have been cast adrift in the solar system. Some of these smaller bits fall to Earth as meteorites. One of the things we notice about meteorites is that many of them have certain similarities of composition and chemical signature. As a result they can be identified into groups. This would imply that these groups have a common origin, likely a particular asteroid. For example, the Howardite-Eucrite-Diogenite (HED) group is a type of meteorite that have long thought to originate from the asteroid Vesta. The connection was first made by Guy Consolmagno, who with Michael Drake demonstrated that the composition of HED meteorites matched the spectra of Vesta back in the 1970s. There are other smaller asteroids that have similar spectra, but Consolmagno noted that of all the HED meteorites found on Earth, none contain a mineral known as olivine, which is found in the mantle of asteroids and planets. This means the HED must have come from a large, intact HED body, which points to Vesta. But when the Dawn mission reached Vesta, it found something unexpected. Vesta is more than 500 kilometers in diameter, which is large enough for it to differentiate. That is, during its formation one would expect iron and other heavy elements to sink to its core, surrounded by a mantle (where you would find olivine among other things) and an outer crust. 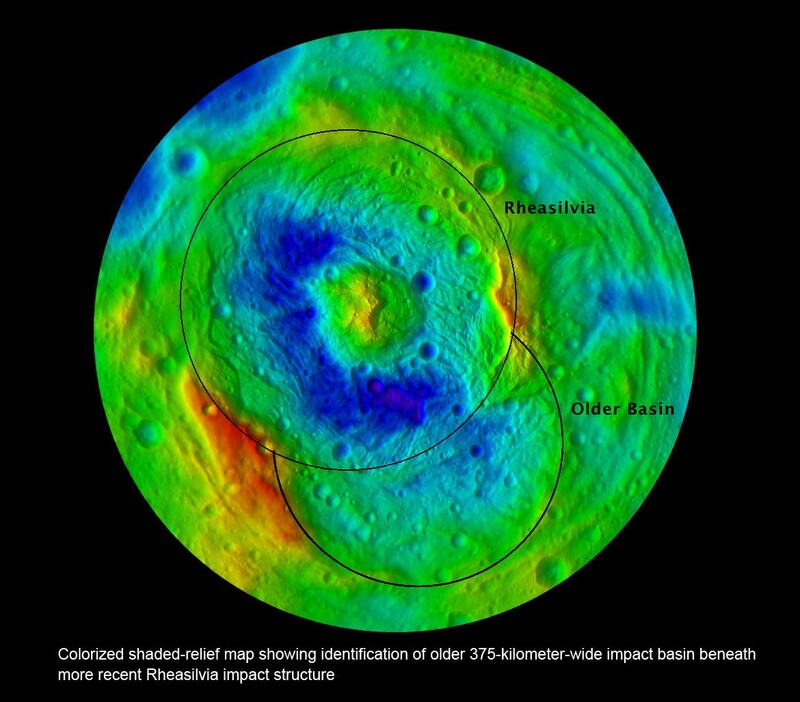 But one thing Dawn noticed was two large impact craters near the south pole of Vesta. These craters were large enough that they exposed the mantle in that area. But what Dawn didn’t find was exposed olivine. That means there’s something odd about Vesta. The impact craters exposed material as deep as 80 kilometers, which is quite deep for an asteroid. The lack of exposed mantle could mean that Vesta just has a really thick crust, but that shouldn’t be the case given its size. But it would be the case if Vesta isn’t an intact world. Basically a proto-Vesta could have been shattered by a collision with another planetoid when the solar system was young. The stripped iron core of proto-Vesta could then re-accrete what material it could. Of course, if Vesta was shattered early on, then the HED meteorites couldn’t have originated from Vesta. So this week Consolmagno presented a talk at the AAS Division for Planetary Sciences meeting arguing against his original theory. The HED meteorites could indeed be material chipped off Vesta from smaller impacts, but the HED material didn’t originally form as a part of Vesta. I should point out that this work hasn’t been peer reviewed, though it has been submitted for publication. Even the idea that Vesta is a shattered body is a bit controversial, so Consolmagno’s conclusions should be considered a bit tentative. But it’s an interesting idea, and it’s a good example of how science works. If you follow the evidence, you might find that even your long standing model turns out to be shattered by new evidence. So you dust yourself off and push forward with a new idea.